Why in hell didn’t I schedule this on a more temperate day? It was 21 degrees at 5:30 a.m. when I scraped the first significant frost coat off my car’s windshield to drive down to the Maine Wharf in Portland. Dawn was slowly breaking over the Atlantic, faint whisps of light harkening a chilly day on the water. Though I was layered up, prepared to don some brand new, drab green Grundens oil slicks to shield myself from the forecasted wind and hopefully stay dry, I did begin to wonder what I’d gotten myself into. What better way to get a sense of how mussel farms work than to get muddy? Doing it in mid-November in Maine just adds some texture to the experience. For me, this was research. 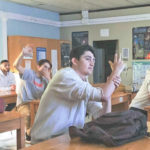 I spend a lot of time talking about shellfish and finfish aquaculture in classrooms and at different speaking engagements. I wanted to have firsthand knowledge of what it takes to seed, grow and harvest some of the best mussels available. Fortunately, Matt Moretti, co-owner of Bangs Island Mussels is happy to welcome visitors to the operation and let them get muddy if they so choose. They just need to understand that harvest days are fixed, regardless of the weather, because that’s how market demand works. Selling high-quality, responsibly grown mussels to restaurants and wholesalers across the country means you don’t get to choose the harvest conditions. Portland has 12 working piers, including the Maine Wharf. Some of these piers are under threat from developers. And so we pulled away from the dock as an early winter sunrise painted the sky pink, orange and light blue. Bangs Island lies just east of Chebeague Island, and not far from Portland’s historic working waterfront as the crow flies. But it still takes about an hour in a re-purposed fishing boat that doesn’t cruise over 15 mph. 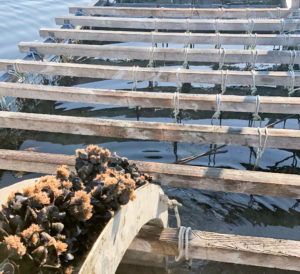 The mussels live, eat and grow on hundreds of ropes dangling from solid wood beams on three large rafts securely anchored a couple hundred yards from shore. The entire operation spans about 3 acres. Each raft has up to 2 million mussels or so in different stages of development, from newly seeded spat (the small seed that grows into three-inch adults) to dinner-size. Millions of mussels at different stages of the three-year growth cycle. 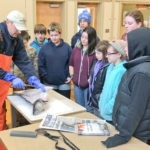 When discussing different harvest methods in classrooms or community events, I also talk about aquaculture practices. Since aquaculture has surpassed wild caught seafood for global direct human consumption, farmed fish, shellfish and seaweed play critical roles in any sustainable seafood discussion. Just as with wild harvest methods, different aquaculture methods have a range of ecological impacts, some of which are beneficial, but many of which are disastrous. 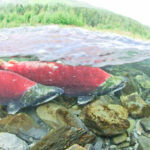 Industrial finfish aquaculture promises “to feed the world.” Yet the litany of debilitating ecological impacts ranging from massive fish escapes (threatening wild populations) to disease, antibiotic use, algal blooms (from excess nutrients from waste and undigested food), sea lice, feed (grinding up wild forage fish populations to make feed pellets), etc. have called into question the overall benefit of such operations. Bivalve aquaculture avoids almost all of these issues. Mussels, clams and oysters are filter feeders. 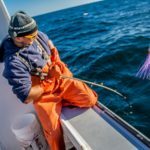 They eat plankton, not ground up forage fish, thereby reducing the particulate matter in bays and estuaries and rendering those ecosystems healthier for a broad swath of marine species. Properly siting them in areas with good current enhances their food source and minimizes oversaturation of nutrients and disease. That said, they are constantly tested to make sure they are safe to eat, particularly after heavy rain events, which can elevate the amount of unhealthy nutrients and toxins they filter. Yes, quality control is paramount. Bangs Island Mussels currently operates from a barge with shed walls and a roof to protect the crew and the mussels from the elements: driving rain, snow, sleet or blazing sun. The hauler starts the harvest process. The process begins with a large winch that hauls up the long, heavy (up to 500 pounds) ropes of mussels and millions of other tiny organisms that attach themselves to the biomass overtime. The winch slowly brings the rope up to a gateway that, with the help of someone standing there, strips the mussels from the rope. Sometimes the clumps can be the size of a soccer ball, but mussels and all have to come off the rope. After the rope has passed through the gate and is mussel-free, you set it aside to be hosed off and re-seeded later with mussels that are too small for market (more on this later). Then you wind up the next rope. 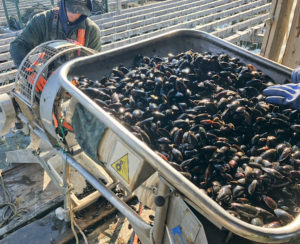 Once stripped, the mussels go up a conveyor belt to a brush declumper, a big machine with a series of rollers and stiff bristles that appear to gobble up the black shells. In fact, these bristles are helping to break up clusters of mussels and remove barnacles, seaweed and other organisms such as sea squirts that can attach themselves to the mussels and the rope. Someone stationed above the “mouth” of this machine physically pushes the mussels into the narrow gaps of the bristled rollers. It’s a physically taxing process. The mussels that come out of the first section of that machine are relatively clean. They are dropped onto a grader, which has another system of adjacent rollers with spirals, like giant screws, that are closely spaced. This array weeds out the mussels Moretti and his crew deem too small for market size. As the screws turn, the smaller mussels slip through the cracks onto a chute and into a waiting bin to be re-seeded onto ropes and dropped back into the water to grow. Market size mussels feed out into another bin that is dragged to the boat and packed in ice in huge totes arranged on the boat deck. Someone stands near the area where the market size mussels arrive and sorts through any remaining clumps held together by seaweed and their beards. 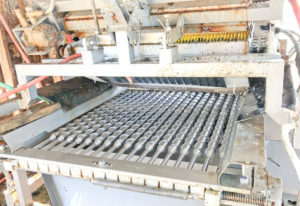 The declumper at the top of the photo uses yellow bristled rollers to separate and clean mussels before depositing them on the grader, which separates the market-sized product from the soon-to-be-re-seeded. We processed about 2400 pounds of mussels (about average for this time of year) in a little over three hours. I was pretty damn happy to sit down and eat lunch … at 10:30 a.m. I felt satisfied with the teamwork involved in a surprisingly smooth and efficient operation considering the task at hand. Everyone had a role, and rotated around a bit to help each other. And the crew patiently coached me on technique and timing. After lunch, we began re-seeding the ropes with mussels that were too small. 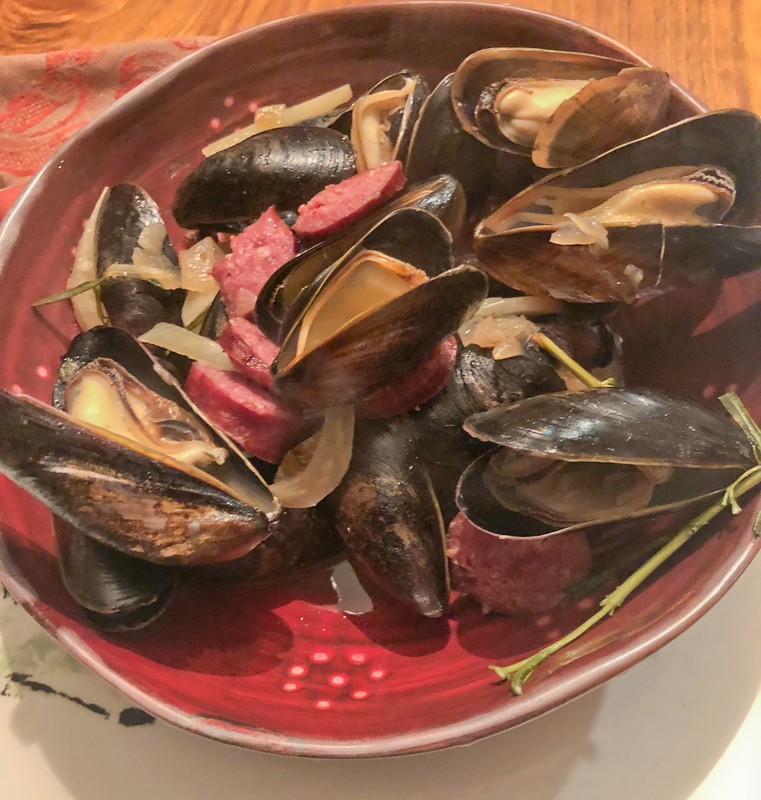 I say too small – we returned mussels averaging just a little over two inches in length on the long edge – even though I’ve been served Canadian mussels that size in New England restaurants. Getting mussels back on a rope and into the water is an intricate process aided by a machine that looks like a product of Jules Verne’s imagination. Called the seeder, or socking machine, this contraption draws clean rope through a type of snare where the mussels are dropped from a hopper onto the rope and enclosed by a thin cotton mesh that wraps the mussels like a sock. This sock will hold the mussels in place until they attach to the rope, before the net naturally biodegrades. It’s a bit of a painstaking process in that you want to ensure the mesh goes on properly and ties off the mussels so they stay on the rope. We loaded several ropes back onto the raft. The seeder, or socking machine in action. Not quite ready for prime time, these mussels need a little more time “on the vine” to get to Bangs Island size. (Turn up the volume). Next we took water samples for the state Division of Marine Resources to check the level of nutrients and toxins in the water. These tests, and direct mussel samples, are frequent, and ensure the safety of the mussels that go to market. 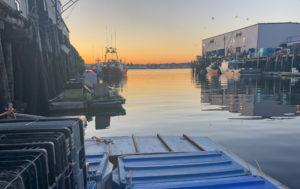 Back at the Maine Wharf, the mussels were hoisted off the boat with a powerful hydraulic lift, and brought into the warehouse where a team waited to do final sorting, grading, cleaning and bagging for market. As with the harvest operation, the final steps toward market readiness are meticulous. Bangs Island has a reputation among chefs and foodies for big meats. That is, not only are the shells generally bigger than most other mussels on the market, but the meat inside them is bigger too. Having opted for Bangs Island’s harvest for over a decade in restaurants and my home cooking (an excellent addition to gumbo! ), it was with a deeper appreciation the next day as I set out to cook a couple pounds for my family. Harvested with my own hands not far from where I live, with a very coordinated process rooted in getting the details right, these mussels drove home one of my classroom and restaurant mantras: Know your seafood. Know your fisherman, or seafood producer. The fruits of spending a chilly day on the water. Follow this link to a recipe for mussels San Remo from my friend Chef Rob Martin at 1652 Restaurant in York, Maine. Thanks to Matt Moretti and my crew mates John, Zack and Ben for welcoming me aboard and teaching me the ropes! It was worth muddying my new Grundens on that chilly morning to build a valuable experience that I’ll share in classrooms and restaurants.